NEW DELHI, Sept 26  A day after convening a meeting of the Cauvery River Water Authority, Prime Minister Atal Behari Vajpayee today despatched a three-member experts team to inspect the water level in the reservoirs of Karnataka and Tamil Nadu to break the stalemate in the current dispute over water sharing. NEW DELHI, Sept 26  The day-to-day hearing of the "tandoor" murder case, in which former Delhi Youth Congress President Sushil Sharma is facing trial for allegedly killing and burning his wife, Naina Sahni, in an oven in a restaurant here in July, 1995, will commence tomorrow. NEW DELHI, Sept 26  An exit poll conducted by Marathi newspaper Lokmat shows emergence of the Congress as the single largest party at the end of the fourth phase of Lok Sabha poll with the party and its allies set to bag 201 seats followed closely by BJP-led National Democratic Alliance with 200. KEONJHAR, Sept 26  Evading police vigil, Bhimasen Mahanta, an accomplice of Dara Singh, wanted in connection with the murder of Australian Christian Missionary Staines and his two sons, cast his vote in the Gojapathara booth under Patna Assembly segment of Keonjhar Lok Sabha constituency yesterday, official sources said today. NEW DELHI, Sept 26  The BJP today claimed that the National Democratic Alliance is heading towards an absolute majority. NEW DELHI, Sept 26 In an important ruling, the Supreme Court has held that in a murder case if the sessions court awards death penalty to an accused and refers the matter to the high court for confirmation of the sentence, the latter should consider the evidence in the case afresh. NEW DELHI, Sept 26  A Congress leader, Mr Ashwani Kumar, has lamented that a major part of the national elections have gone through with the voters being asked to exercise their franchise not on development and related issues, but on Kargil and personal attacks. NEW DELHI, Sept 26  The filing of closure report by the CBI in the Tanwar murder case in a city court has been questioned by a lawyer saying the agency did not inform the Delhi High Court which is hearing a public interest litigation in this regard. NEW DELHI, Sept 26  Eminent writer Khushwant Singh says the late Indira Gandhi behaved like a "village mother-in-law" who treated Maneka Gandhi "hurtfully" while favouring the other daughter-in-law Sonia Gandhi. NEW DELHI, Sept 26  The Delhi High Court has issued notice to the Centre on a public interest litigation seeking free and compulsory education for children till they attain 14 years of age in all schools of the Capital. NEW DELHI, Sept 26  In an era of liberalised economic policies, a greater degree of discipline is needed in various organisations to ensure that employees work efficiently and effectively. NEW DELHI, Sept 26 (PTI)  A day after convening a meeting of the Cauvery River Water Authority, Prime Minister Atal Behari Vajpayee today despatched a three-member experts team to inspect the water level in the reservoirs of Karnataka and Tamil Nadu to break the stalemate in the current dispute over water sharing. The team headed by Water Resources Secretary Z. Hasan comprising experts of the Central Water Commission are expected to visit the catchment areas of Kabini, Hemavathi Krishnarajasagar and Harangi in Karnataka and Mettur and the delta areas in Tamil Nadu to assess the situation in the light of claims and counter-claims by the two riparian states. The team is expected to be back in the Capital in time to apprise the Prime Minister, who as authority Chairman would preside over the Wednesday meeting. Mr Vajpayee spoke to Chief Ministers of both Karnataka and Tamil Nadu today and discussed the latest situation. The authority meeting is expected to break the stalemate in the current dispute over the sharing of waters following refusal of Karnataka to release water to starving paddy crops in Tamil Nadu. Sources said the meeting is expected to hammer out a consensus formula on the recommendations of the monitoring committee which met on Thursday. The committee recommended that Karnataka release nine tmc ft of water to Tamil Nadu by October to make good the deficit in addition to mandatory releases recommended by the Cauvery Tribunal in its interim order. Karnataka, however, has rejected the recommendations and refused to consider them. They cited the instance of the then Prime Minister P.V. Narasimha Rao directing Karnataka to release six tmc ft of water on the New Year day in 1996 in a similar crisis situation. Additional Sessions Judge G.P. Thareja has issued the order saying the hearing will be conducted on a day-to-day basis from Monday. The court passed the order on an application filed by co-accused Keshav Kumar seeking regular hearing of the case and said: "The court appeals to all counsel of the case that they will not ask the court on any ground on whatsoever to change the order until the trial is finished". Keshav who along with Sushil Sharma has been lodged in judicial custody since July 1995 in his application said the manner in which the trial was continuing, it would take another four years to complete. The court, which has so far recorded evidence of 53 out of 100 witnesses, has been asking the amicus curie and the special prosecutor for regular hearing in view of a Supreme Court direction in this regard but the amicus curie had earlier expressed his inability to appear in the court every day considering his number of briefs. The counsel must consider the agony of an accused suffering for the last three years, the court said adding "they (counsel) must assist the court so that no person who is languishing in jail should have a feeling that the court does nothing". According to the charge sheet on July 2, 1995, the two policemen, Abdul Nazir Kunju, a Delhi Police constable, and Chanderpal, a Home Guard, while on patrolling duty outside the hotel saw thick cloud of smoke emitting from the hotel's outdoor premises. When, on getting suspicious, they entered the hotel premises after scaling its boundary wall, they found "something big" burning in the tandoor. Inquiries made by them revealed that the accused were trying to dispose of the body. Since, the fire emitting from the tandoor was touching the ceiling of the restaurant, the policemen, in order to stop it from spreading, doused it with a bucket of water. Later, in their evidence, Kunju and Chanderpal, stated that when they enquired Keshav, the Bagiya's manager, he allegedly informed that "he was burning Congress banner. Sushil Sharma, who was standing at the gate was trying to prevent us from entering inside premises". The police had arrested Keshav on the spot, Sushil Sharma was arrested after eight days in Bangalore. NEW DELHI, Sept 26 (PTI)  An exit poll conducted by Marathi newspaper Lokmat shows emergence of the Congress as the single largest party at the end of the fourth phase of Lok Sabha poll with the party and its allies set to bag 201 seats followed closely by BJP-led National Democratic Alliance with 200. The survey, which is at variance with the exit poll conducted by the Development and Research Services for Doordarshan which gave the NDA 235 seats and the Congress and its allies 145, forecast that the Congress and its allies were expected to secure 42 of the 74 seats where voting took place yesterday. It maintained that the NDA would only be able to manage 31 seats in the fourth phase with the one remaining seat going to a smaller party. The poll was based on a survey conducted in 83 constituencies with a sample base of 19,875 voters spread over 11 states in the first four phases of Lok Sabha elections. The poll said that until the third phase of balloting for 344 seats, the NDA was ahead with 169 seats while the Congress had to be contented with 159 and the remaining 16 going to others  Janata Dal(S), Left parties and the Nationalist Congress Party. NEW DELHI, (UNI): The exit poll conducted by Jain TV has indicated that the BJP-led National Democratic Alliance (NDA) has lost ground in its bastion Uttar Pradesh in the fourth round of polling yesterday. The situation for the alliance was near same in Madhya Pradesh where the party is heading for a loss of seven seats to the number of constituencies it won in the last elections. However, there is good news for the BJP and its allies in Bihar, Orissa and Himachal Pradesh where they are clearly ahead of the Congress and its allies. The fourth phase survey covered the views of about 5500 voters in 30 representative constituencies across the nine states which went to the polls yesterday. While in Bihar, the NDA is expected to succeed in further eroding the base of the Rashtriya Janata Dal of Mr Laloo Prasad Yadav, the exit poll predicts that the party would maintain its dominance in Himachal Pradesh and gain ground in Orissa. According to the survey, in Uttar Pradesh an acute 53 per cent anti-establishment sentiment against the Kalyan Singh Government appeared to have harmed the BJP. To add to that is a massive feeling (61 per cent) against the sitting BJP MPs. KEONJHAR, Sept 26 (PTI)  Evading police vigil, Bhimasen Mahanta, an accomplice of Dara Singh, wanted in connection with the murder of Australian Christian Missionary Staines and his two sons, cast his vote in the Gojapathara booth under Patna Assembly segment of Keonjhar Lok Sabha constituency yesterday, official sources said today. The police had kept vigil on four polling booths where Dara and three of his associates were expected to vote. Warrants are pending against all four of them. While Dara, whose name figured on the electoral roll at booth number 133 located in Maliposhi village, and two of his aides Mohan Mahanta and Milan Mahanta did not turn up to exercise franchise. Bhimasen entered the booth unnoticed and cast his vote. The district administration had directed the local police to maintain a watch on the four booths. A large posse of armed policemen were present at Maliposhi where a large crowd also waited with excitement to find out if Dara, who carries a reward of Rs eight lakh on his head, would come. But they were disappointed. Dara and his associates have been on the run ever since the burning alive of Staines and his two children. The fugitive has also been named in the FIR lodged with the police after the gruesome killing of a Muslim trader. Shaikh Rehman at Padibeda village in Karnajia sub-division of Mayurbhanj district. In a statement, the party Vice President, Mr K.L. Sharma, said through all exit polls and other projections, it was becoming clear that the BJP-led NDA was heading towards an absolute majority in the 13th Lok Sabha. Accusing the Congress for raising petty issues during the election campaign, Mr Sharma said no amount of misleading propaganda and diversionary tactics could create misunderstanding in the voters mind for determining their choice for the 13th Lok Sabha. He said for the first time, the Congress was not contesting the Lok Sabha elections as a party but as a family coterie and Mrs Sonia Gandhi was not contesting as the Congress President but as a mother of Priyanka and Rahul. NEW DELHI, Sept 26 (PTI) In an important ruling, the Supreme Court has held that in a murder case if the sessions court awards death penalty to an accused and refers the matter to the high court for confirmation of the sentence, the latter should consider the evidence in the case afresh. Reversing a Madras High Court order acquitting a triple murder accused after a sessions court gave capital punishment, the apex court said: "It is the duty of the high court in a death reference to consider the evidence afresh." A three-judge Bench headed by Mr Justice G.B. Pattanaik said "The proceedings before the high court in such a case require a reappraisal and reassessment of the entire facts and law so as to come to its independent conclusion but while doing so, the high court cannot also totally overlook the conclusion arrived at by the sessions judge." Rajendran was convicted by a sessions court for murdering his wife and two daughters aged six and two years on the basis of circumstantial evidence but the high court, before whom the accused did not file any appeal, acquitted him of all charges. Mr Justice Pattanaik said the high court did not examine the circumstances established by the prosecution evidence and without examining the conclusion of the trial judge, "in a most slipshod manner" acquitted the accused. Rajendran as per circumstantial evidence had first stangulated his wife to death over a petty quarrel and then set his hut on fire in which the two children were also killed. Mr Ashwani Kumar, a former Additional Solicitor-General of India, told The Tribune that his party sincerely wished the Bharatiya Janata Party had not made Kargil an election issue. "We wish Kargil was not brought about into political arena. The BJP made it into an election issue. The supreme sacrifices of our brave soldiers should not have been made the basis of election campaign," he said. Mr Kumar, who is member of the AICC Media Department, said the real issues like development, economy, tackling of problems associated with population, unemployment, lack of basic amenities, health and education should have been the issues on which the election campaign run. The current general elections which has now entered its final phase, he said, would be a watershed in Indias politics as the people had to give their verdict to end political uncertainty and give a stable government for five years. Mr Kumar did not agree with the charge of rival political parties that the Congress President, Mrs Sonia Gandhi and not have the requisite experience to become the Prime Minister or her foreign origin should come in the way. He said the Congress did not abandon the Pachmarhi declaration in striking alliances as a junior partner in Bihar and Tamil Nadu. The Congress, he said, recognised the ground realities and got the best deal in the process. NEW DELHI, Sept 26 (PTI)  The filing of closure report by the CBI in the Tanwar murder case in a city court has been questioned by a lawyer saying the agency did not inform the Delhi High Court which is hearing a public interest litigation in this regard. Appearing before Chief Metropolitan Magistrate (CMM) R.K. Gauba last week, advocate S.N. Pandey, whose criminal writ petition in the matter is pending before high court, said "the CBI was trying to overreach the high court proceedings." Mr Gauba asked Mr Pandey and complainant Kaveri Tanwar to file their objections to the closure report in writing and allowed them to inspect the material submitted by the CBI. The CMM directed the CBI to come up with response to the preliminary objections raised by Mr Pandey and fixed October 26 as next date of hearing. Mr Pandey, who appeared before the court following a notice issued by the court on the CBI closure report, informed the CMM that the criminal writ petition was coming up before the high court on October 6. On September 1, the CBI had sought closure of the probe into the mysterious murder of Dr Surinder Tanwar, a personal medical consultant to former Congress chief Sitaram Kesri as it failed to achieve any breakthrough. 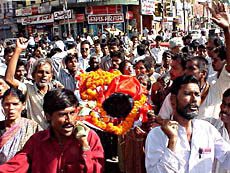 Dr Tanwar, who often used to visit Mr Kesri for his medical check-up, had disappeared on October 28, 1993, after dropping his wife at her Allahabad Bank office, Janpath here. NEW DELHI, Sept 26 (PTI)  Eminent writer Khushwant Singh says the late Indira Gandhi behaved like a "village mother-in-law" who treated Maneka Gandhi "hurtfully" while favouring the other daughter-in-law Sonia Gandhi. "I think the chemistry was wrong. Right from the day Maneka entered the household, I think Indira Gandhi didnt like her. She thought her son had married below their type, which is really quite wrong because she came from a respected family of land owners and cattle breeders," he said in an interview to the BBC programme, "face to face", to be telecast on September 29. In the interview, the noted novelist expresses his admiration for the late Prime Minister and details his relationship with Sanjay Gandhi, who had died in an air crash. Khushwant Singh, who knew the Gandhi family intimately, said Manekas grandfather was knighted by the British, and he thought Indira Gandhi in her assessment was wrong as she could never find anything right with Maneka. "Maneka often complained to me about her (Indira Gandhis) belittling her all the time in front of Sonia. I remember once after Sanjay was killed in the air accident, she told me of a party Indira Gandhi had organised for Mrs Thatcher (former British Prime Minister) where Rajiv and Sonia were seated on the main table and she was seated with the staff including R.K. Dhawan and others," the novelist said. Giving one more instance of Indira Gandhis attitude towards Maneka, he said: "She would really behave like a village mother-in-law. Among other things shed bring things like Pandit Nehrus pen or watch and in front of Maneka tell Sonia, Sonia, Id rather, you have these things from my father as mementos, leaving Maneka out. These were hurtful things to do and she was constantly doing it." The noted journalist described Sanjay Gandhi, to whom he was very close, as "a bit of a bully" and "a loveable goonda". He claimed Indira Gandhi was scared of her son and Sanjay was a real ruler of the country both during Emergency and during the short period in 1980 before he died. "I liked him I admit. He was a bit of a goonda, a bit of a do-gooder. There was a combination. He was an impatient man. He knew hed never get elected but he wanted to run the country. And thats what he proceeded to do in Emergency. He was the ruler of this country during Emergency and later when they came back to power for the short time before he died," he said. He said Sanjay had treated him like an uncle and often turned to him for advice. "I was all for his zeal for family planning, even for compulsory family planning, for clearing slums - and you cant do them gently, you have to use bulldozers." A Division Bench comprising Chief Justice S.N. Variava and Mr Justice S.K. Mahajan directed the Centre to file its reply to the petition by October 6, the next date of hearing. The PIL filed by Mr Satya Pal Anand submitted that he had filed the petition on the basis of an order passed by the Supreme Court on his petition in 1998. The Supreme Court had refused to monitor the matter any further and left it for the state concerned to implement the order while disposing of the petition. To make this possible, an enterprising officer with the Unit Trust of India, Mr Dalji Singh Nirman, has brought out a book on rules and regulations governing disciplinary proceedings and procedures. The book titled "Reference Book for Disciplinary Proceedings and Procedures" explains how the principles of natural justice and disciplined conduct reflect themselves in the entire proceedings of disciplinary action on the part of the employer.